Georgia Governor Nathan Deal, left, holds a proclamation presented to him by Technical College System of Georgia Board Member Joe Yarbrough of Rocky Face, Georgia. The proclamation honoring Governor Deal’s service to Georgia also highlights a new scholarship being created in his honor. The Nathan Deal Scholarship program will benefit students who attend Georgia Northwestern Technical College. It was not only Georgia Governor Nathan Deal who would receive honors this month at the Greater Dalton Chamber of Commerce Banquet. In paying tribute to the governor and his work towards preparing a more educated workforce, industry leaders decided to make the honor also extend to the future students of Georgia Northwestern Technical College (GNTC), as well. In a resolution drafted in honor of Governor Deal, the first recognition of the “Nathan Deal Scholarships” for future Georgia Northwestern students was made. The program will offer selected applicants $2,500 scholarships in the initial years with plans to increase the award to $5,000 per winner. 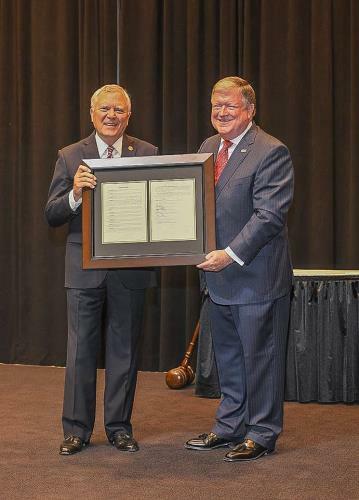 The president and CEO of the Carpet and Rug Institute (CRI) and Technical College System of Georgia (TCSG) Board Member Joe Yarbrough presented the resolution to Governor Deal at the banquet. Mr. Yarbrough, a Rome, Ga., native, said this was about recognizing the governor for his dedication to technical education in Georgia. The CRI board of director members behind the creation of the Nathan Deal Scholarship program are Chairman of the Board Jim McCallum (Milliken Floor Covering Division), Vice Chairman of the Board Jack Ganley (Mannington Commercial Carpets), Treasurer David Repp (Mohawk Group), Marc Ammen (Universal Fibers), Vance Bell (Shaw Industries, Inc.), Mark Clayton (Phenix Mills), Len Ferro (Tandus Centiva), Daniel Frierson (The Dixie Group), Ralph Grogan (Bentley Mills, Inc.), Chip Howalt, (Textile Rubber and Chemical Company), Jeffrey Lorerbaum (Mohawk Industries, Inc.) Franco Rossi (Aquafil USA), and Robert Shaw (Engineered Floors, LLC). “We are appreciative of what the Governor has done for us,” added Mr. Yarbrough. “And, we are appreciative of what GNTC has done with the expansion of the Whitfield Murray Campus of the college. One which includes the commitment of a new building opening next year.” Governor Deal, GNTC President Pete McDonald, Yarbrough and Northwest Georgia business leaders and legislators broke ground on the 80,000-square foot facility set to open in 2019.